There are those who care. Those who can. have the power to make changes. They might not be able to change things by edict, but they have real power, influence and enough control to cause change to happen. Those who care, deal with whatever it is you are talking about regularly, they live with the pain. 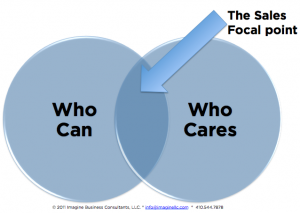 The objective is to focus your sales strategy on the people who can AND who care. The challenge is that often those who can, don't care about what you do; and those who care don't have the power or influence to cause change. I worked with a relocation company. Their problem was that the person who lived with the relocation program problem had no power to change the process or resource allocation decisions to fix it. I worked with an audio/visual teleconferencing company that promised increased productivity and longer life of equipment. Their problem was that they geared their approach to the facilities manager who didn't care about productivity and had no control over budget. I work with an IT company that promises efficiency and a more positive environmental impact. The problem is that the people who manage the process they impact (they're the ones "who care") have little to no power in determining how the process will be defined or implemented (those who can). When confronted with challenges like these, you must identify who has enough power to lead to the change you want and answer the critical question, "What do they care about that we can impact significantly enough to matter?" In the case of the relocation management company, we realized that we needed the authority and sponsorship of the senior HR people AND the CFO/Finance office. As mentioned, we knew they didn't worry/care about the relocation program. What they cared immensely about was having the best talent to drive company initiatives. So we stopped being a relocation company that supported talent; we became a talent management company that supported relocation. Please know, that it required more than a shift in semantics. It required a shift in being. We started conversations at talent, and the talent issues that prevented them from achieving their business results. We then traced those issues to how a relocation program impacted them. Then we were able to work deeply with the people who cared, with the support of the people who could do something about it.